Naagin Season 2 30th October 2016: Yamini yelled on Sesha that she killed Shivangi and they had no way to get the nagmani. Sesha said that Rocky was dying. Rocky’s cousins tried to cheer him up. He asked everyone to stop and asked them if they had gone mad. It was not a joke for him, and he had lost Shivangi. Yamini came there. She slapped the cousins and asked them how she dared ask Rocky to get married when he had not forgotten Shivangi. Sesha thought that she was an overacting queen. She acted as getting a heart attack. Shivangi went back to the temple and told sadhu that a tiger attacked her, but Snake saved her. She asked him if she too was a naagin. He denied. Rocky waited while the doctor checked Yamini. He came out saying that her condition was critical and she would die soon. Rocky showed his concern for her. Yamini stated that she wanted him to marry a snake for her sake. He agreed and walked out. She acted having pain. 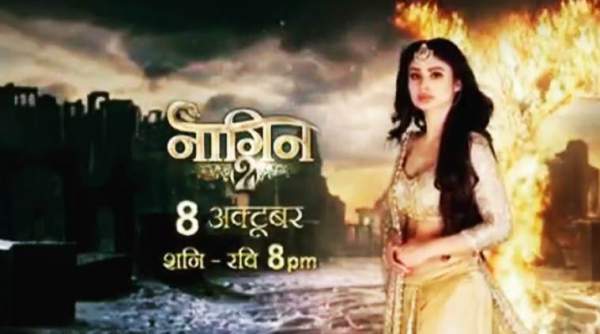 Check: Naagin 2 29th October 2016. Rocky went out and said that he could marry anyone except Sesha. He stated that he knew who she was. He stated that his love would only be for Shivangi and not anyone else. He agreed just for the sake of Yamini. Sesha stated that she too did not want to take Shivangi’s place, but he could marry her at least. He agreed to the marriage. Sesha got very happy as Rocky decided to marry her. Yamini said that her plan never failed. Rocky and Sesha’s engagement was done. Yamini told him that she was really happy for him. She complimented Sesha too and said that she was looking fantastic. Shivangi went into Rocky’s house, but the cousins stopped her and stated that they all thing that she was dead. She said that she just wanted to ask Rocky as why he betrayed her. Rocky and Sesha exchanged rings. Sesha felt sad that he still loved Shivangi. Shivangi said that Rocky and his family killed her family and she would take the revenge. She realized that she had powers of a naagin. She stated that she would not spare anyone who killed her mom and her family. Sesha came as a snake. Yamini scolded her and asked her not to come as a snake in the house. Shivangi and Gautami packed their bags and found a naagmani book and thought what it was. Shivangi read it and reminded that Shivanya told her once. They both went to Haveli. Shivangi was afraid to go in haveli. She entered in and found a snake idol there. She was shocked and afraid to see snakes there. He saw her mom picture there and thought that she had to know the secret.